We came to Mount Evans, Colorado for the chance to see Mountain Goats. Specifically - baby goats, born a few weeks earlier, called "kids." Late June is perfect for this, because the kids are very small and curious, and the older goats still have their full winter coats. Those coats start falling off in July. 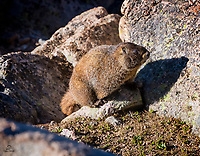 Special bonus was a Yellow-bellied Marmot that let us get fairly close to it.